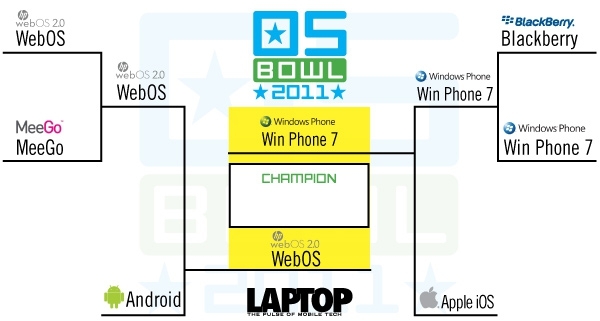 WebOS vs. Windows Phone 7: Fight! "HP's webOS trounced Nokia's Meego in the first round, then fought off a more determined Android in the semis to make it to the final. On the other side of the bracket, Windows Phone 7 got past BlackBerry 6 before thoroughly trouncing Apple's iOS in the last round with more than 80 percent of the vote. So after taking on two giants in this field, the last OSes standing are ready to go gridiron." Voting ends soon, and WebOS is ahead by a couple of percentage points - jump on to the poll and vote! That has got to be THE stupidest thing ever. If someone had posted a link on MacRumors then iOS would have won by 10 Trillion to 1 ... same for Crackberry or Phandroid or whatever. We know that sales are so bad that Microsoft are using lies to pretend it is selling ... so what does it matter that either of these mobile OS's that fall in the 'other' category when it comes to market share are battling for 'best'. Lighten up! It's just a fun poll, not a plebiscite on euthanasia. I have no problem with fun silly polls, but are you really telling me that in 2011 a site not intended for elementary school kids can't do better than a brain-dead 'witch r bezt' poll? Aw, comon', this is a Windows Phone enthusiast site. If anyone's going to want to chant "Rah! Rah!" for their platform, it will be the people here. I posted it at 9pm at night, so it's not like it was "hot news" or anything. I have no issues with the news post and certainly not rousing enthusiast support in the poll. Don't get me wrong ... None of my stuff was directed at you or WPThoughts! My thoughts were about the poll.